I, Adarsh Boodnah, started my journey on the 4th of July 2016 in Elite Business School, Mauritius in the field of hospitality with the Confederation of Tourism and Hospitality Courses. However, choosing the appropriate institution was not an easy task. Firstly, I wanted to go for further studies in Switzerland but unfortunately, I had certain financial constraints. I applied for the local hospitality courses in a public institution but to my disappointment the entry requirements did not match my A level results. 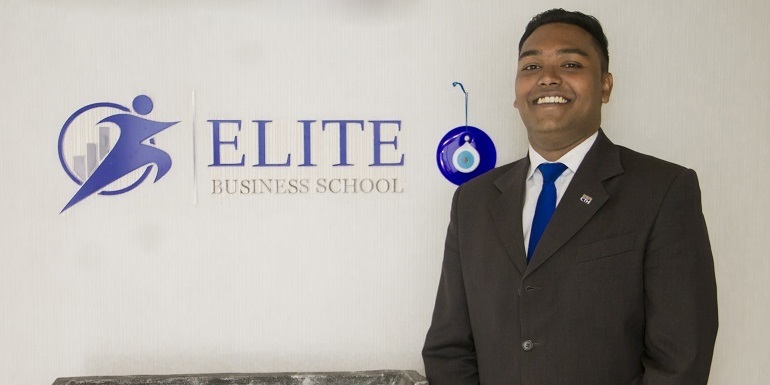 I could not see any hope to pursue my international dreams when finally, I heard about Elite Business School. Soon after I attended the counselling, I was convinced of being set on the right track with CTH programme and took the right decision in taking my admission in EBS. Being the only Mauritian student among several international ones was quite awkward in the beginning but with time, life lasting friendships developed wherein I enjoyed the learning that happened through the sharing of ideas and diverse cultures from various parts of the world. Mrs Leena Pem Sewpaul, my director who had promised to help me get a job placement in a five-star resort kept her words and I got professional exposure to the world of work which is crucial for future graduates. I was employed on a part time basis that was twice a week. Hence, my education did not only consist of in class learning which is only academic since EBS catered for an overall development of its students to be able to face real world challenges. As I always had a strong liking for gastronomy and my dream was to experience the job of a chef, I was lucky to get the opportunity to work closely with them in the main kitchen of the hotel during my training. This helped me enormously to understand how these operations work and to be able to write my assignments. I was proud to share the skills that I acquired with my fellow university mates through a cold salad presentation in our institution and which was a success. At that moment I experienced the real confidence that was built in me to face the world of hospitality. Elite Business School implies quality education whereby you are trained by the best lecturers to whom I will be forever grateful. Elite does not only focus on studies but also on well-deserved recreational activities and events that enhances the growth of students. Overall personal development of students is also primordial for Elite which organises outings, industry visits or societal activities such as blood donation. Moreover, there are open days whereby future students get the chance to get a proper counselling. I got to participate in all such activities and I can proudly say that these have helped to forge my character and personality. I was dumbstruck when I got to know by the Director and the Business Development consultant Mr Das that I will be going for my internship in the United States. They stick to their words and provided me with all support to make my dreams come true. This shows the level of professionalism at Elite Business School. Today I am moving to US for one-year internship in the food and beverage department of the prestigious Holiday Inn Sheridan convention centre. This opportunity of a lifetime is attributed to Elite...and CTH. My sincere thanks to the establishment EBS and professional body CTH for shaping me not only on a professional level but also personally. The best reward is to have been able to make my parents proud of me.